Attention San Diego area ukulele players (and wanna be ukers), I’ll be at Bertrand’s Music on Wednesday, February 22, 7-8pm for a free Ukulele Circle sponsored by Kala Ukuleles. As the flier below says, there will be fun, prizes and snacks! 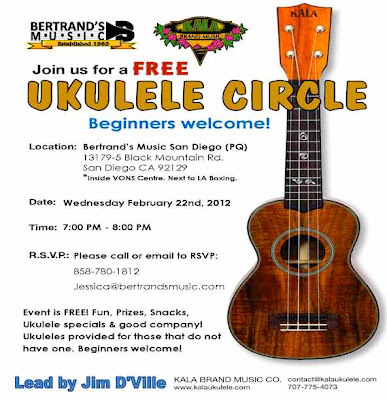 Kala will also be filming the event for a promotional video on in-store uke circles. The more folks we have on hand the better, so mark your calendars for this fabulous ukulele event this coming Wednesday! Go to the Bertrand’s website to register for the event and save your spot.